A car avoids a pothole on Lincoln Drive near Gypsy Lane in Philadelphia on January 14, 2018. Avery Mitchell was cruising down Lincoln Drive toward the Schuylkill Expressway on Saturday when his car hit, in his words, "a huge crater." The crater – a massive pothole – flattened one of his tires, and his Scion xD limped to a nearby friend's place. Mitchell vented on Twitter, and other drivers – also finding their tires flattened by destructive holes on the already challenging curvy road that runs along the Wissahickon Creek – joined him. "Y'all need to fix that huge pothole on Lincoln Drive," one of them tweeted to Philly311, the city's repository for service requests. Another wrote of a "crater that swallowed up two cones" and said he had seen it damage four vehicles. "And who do I talk to about replacing my now flat tire??" fumed @StanLeBeats. @PhilaStreets @philly311 There is a large pothole (more like a crater that swallowed up two cones) southbound on Lincoln Drive (between Gypsy and the Ridge Ave exit). So far I've seen 4 vehicles with immediate damage to their vehicle! @philly311 y’all need to fix that huge pothole on Lincoln Drive approaching Kelly Drive. And who do I talk to about replacing my now flat tire?? I’m sick of this city and these potholes. The drama around the potholes, one on Lincoln Drive near Ridge Avenue and another on Lincoln near Johnson Street, reflected the struggle of many drivers across the region – one likely to play out well into spring. Wild temperature swings in the last week – from the single digits last Sunday to the 60s on Friday, and then back down to this week's predicted lows in the teens and 20s – provide prime conditions for potholes. "That compromises any unstable road structure and any concrete that may not be completely stable," said Jana Tidwell, spokeswoman for AAA Mid-Atlantic. "We're going to see these potholes pop up." The auto club responded to 1,916 calls about flat tires in Bucks, Chester, Delaware, Montgomery, and Philadelphia Counties between last Sunday and Friday, up about 20 percent from the same period last year, when 1,614 calls for help came in. Out in the suburbs of Montgomery County, "we responded to member calls in King of Prussia, coming off 202 onto East Swedesford Road and another one at the exit for I-76 East in Conshohocken and then I-76 between Exits 338 and 340," said Jim Lardear, spokesman for AAA Mid-Atlantice. Another member called in a flat tire at Exit 13 on I-476 near the border of Delaware and Chester Counties, he added. In Philadelphia, the Streets Department has filled at least 1,600 potholes since January 2017, according to its website. The department said it filled the potholes on Lincoln Drive near Ridge Avenue and Johnson Street on Saturday. It also plans to repair additional potholes on Lincoln between the Gustine Lake interchange and Gypsy Lane, and Wissahickon Avenue and Gypsy Lane. A broader project to repair deteriorating pavement, traffic signals, and guardrails on Lincoln is expected to start this year. Mitchell, 21, said the repairs to his car will cost $600. He had no warning about the hole he hit – no orange traffic cone, or any other item flagging it, Mitchell said. "This is something that could have been avoided," he said. "Fortunately I was able to make it off the drive and wasn't stuck." Lincoln Drive isn't the only pothole peril. 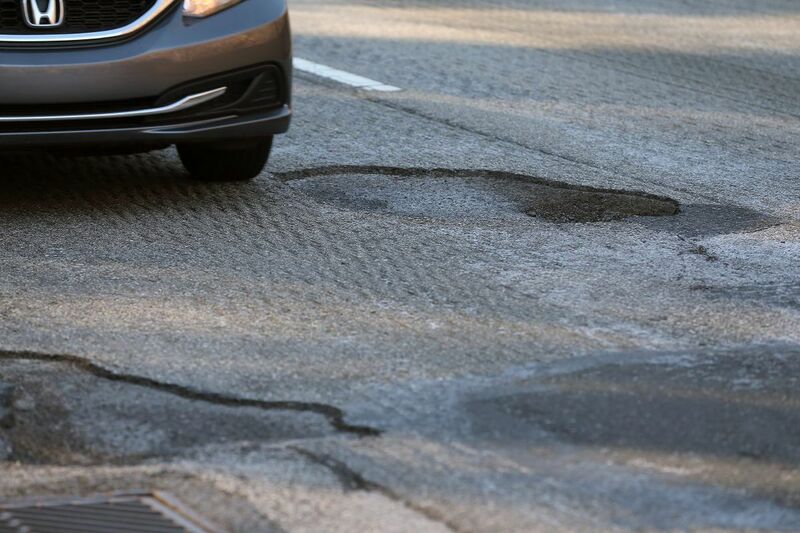 KYW Newsradio reported that a massive pothole repair on Sunday morning was taking place on the southbound Roosevelt Boulevard ramp leading to westbound I-76 — and creating delays. In the city's Northeast, the Somerton Neighbors Association reported a whopper of a hole in the 10900 block of Bustleton Avenue. Seven cars "lined up in the parking lot at CVS with flat tires and two more in the Wawa parking lot. Horrible to be out changing tires on a night like this," the group posted on its Facebook page. AAA's Lardear said a company study estimated that pothole damage costs U.S. drivers about $3 billion a year. On average, American drivers report paying $300 to repair pothole-related vehicle damage, but depending on the extent of the damage, the make of the vehicle, and the make of the tires, repairs could easily exceed $1,000. Anyone can report a pothole that needs fixing in Philadelphia – just download the free app @philly311 on a smartphone and provide the location. Or you can do so at the city of Philadelphia's website: https://beta.phila.gov/.